If I have learned anything while making my Saint Cross Stitch Patterns this past year and a half, it is that we have so many awesome saints in the Catholic Church. SO MANY! Every time I finish making yet another massive batch of patterns of beloved saints, I come across a few more saints that I can’t believe I have yet to make a pattern for. There are just so many good ones. What a blessings our Catholic Faith is! In the past month or so I have made two new patterns and it just doesn’t seem right not to share them with you. So, here they are. 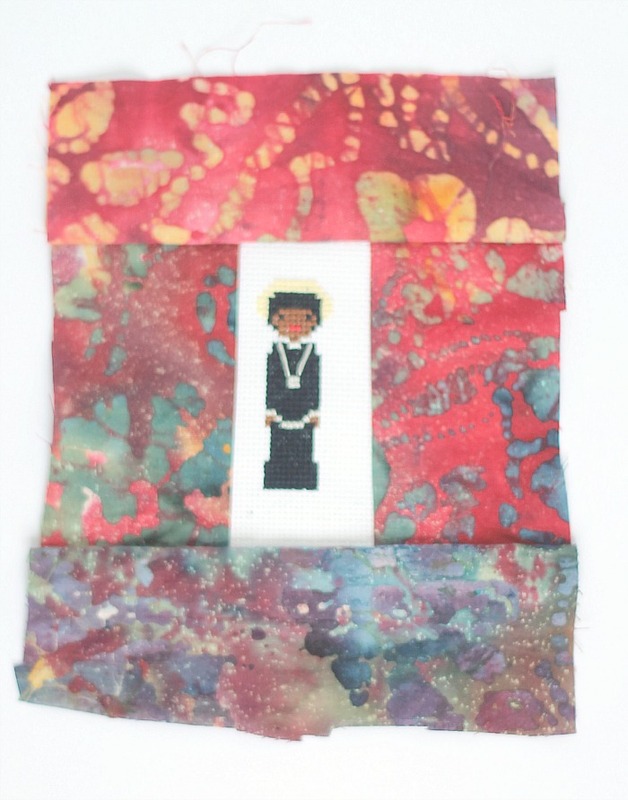 Free patterns for St. Barbara and Blessed Oscar Romero. 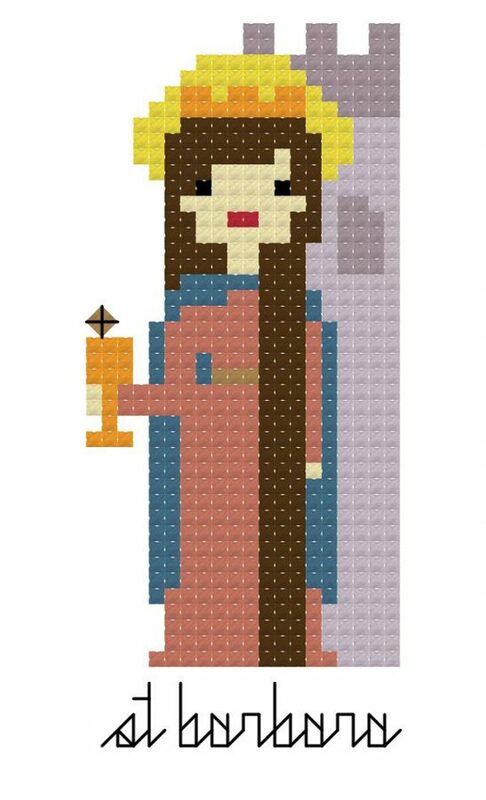 The first new pattern is of St. Barbara. I made this pattern just before Christmas so that I could stitch up a little rosary case for my mother, whose name happens to be Barbara. My mom, who is one of the biggest supporters of this blog, and the one person I KNOW will share my new posts on Facebook, started dropping hints about St. Barbara a while back. 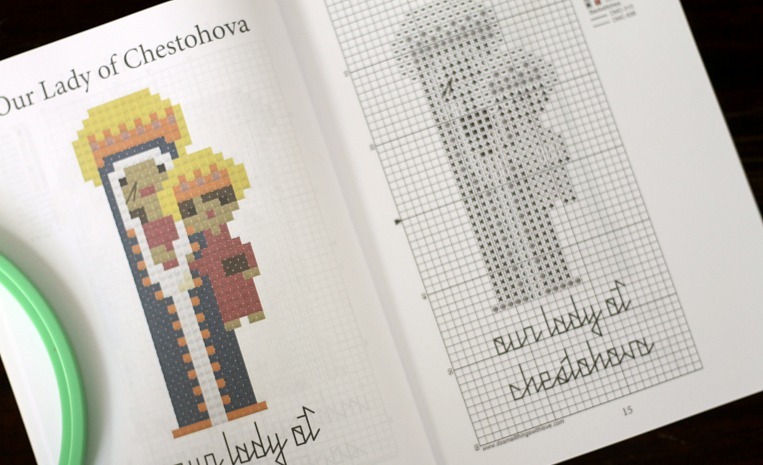 She picked up my Saint Cross Stitch Book and flipped through it looking for St. Barbara. When she didn’t find her in there she had to tell me all about St. Barbara, and how she is the person Rapunzel is based on (only she is WAY cooler than Rapunzel and SO MUCH more awesome). I nodded along as she told me. But then she brought up St. Barbara like 5 more times…and I finally got the hint. I made a pattern for this incredible saint for my mother and almost got it done in time for Christmas. And I have to say, my mom was totally right. St. Barbara is so awesome. She was trapped in a tower and an angel came and brought the Eucharist to her. Why don’t they make a Disney movie about that? The next pattern is of Blessed Oscar Romero. He is another great, although controversial, Catholic figure. This pattern came about when a dedicated blog reader wrote to me about a project her parish was hoping to do for their sister parish in South America, and I was so happy to help them out. Over the years it has been such an incredible honor to play a small role in the beautiful catholic gifts and goods made with my patterns, especially those used to raise funds for good and holy work. You guys are so good to me. 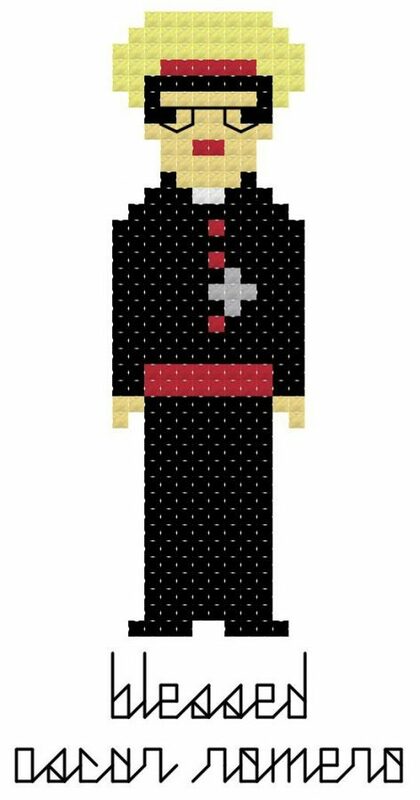 Here is how I designed Blessed Oscar Romero in cross stitch. He is much more modern than St. Barbara. If you don’t know much about Blessed Oscar Romero, check out his biography. Fascinating. 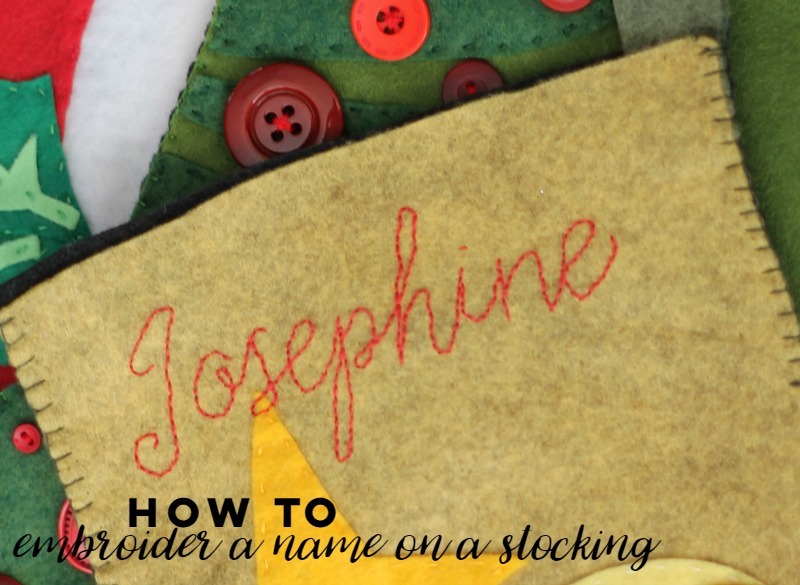 Lately I’ve been getting lots of questions about stockings: where to get them, how to make them and how to add a child’s name to the top of a stocking. There are, of course, lots of answers to these questions, but I thought it might be helpful to put together a little tutorial on the subject of stockings, specifically, how to embroider a name onto a stocking. And before I start I just want to state this very clearly–this is very simple and easy to do, seriously. Even if you have very minimal embroidery skills or experience, even if you have terrible handwriting (like me), you can do this and make it look beautiful. It just takes a couple of supplies, some time and patience. And a beautiful person who needs a stocking. Completed or bought stocking, with space to embroider at the top. If you are making your own stocking, embroidery the name before attaching the back. If you are stitching on a pre-made stocking, pin down the back so you have access to the front to add the name. As a first step, head to your computer and open PicMonkey, or a similar program. Select “design” from the top menu and on a white screen, pick a font and write out the name you wish to embroider. 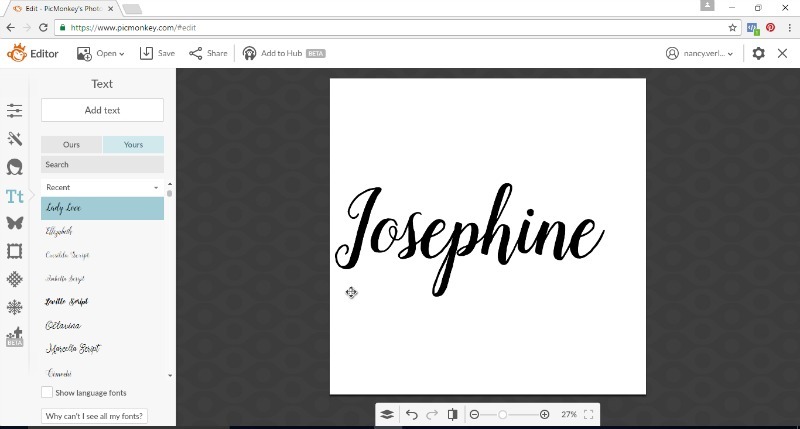 Picmonkey offers several free fonts, but I opted to use a font I purchased. I am making a special stocking for my sweet little Josie, who joined our family in May. Resize, using the zoom in or out on your screen, until the name is a size that will fit nicely on your stocking. Then, take your tissue paper and tape it to your computer screen. Trace the letters onto the tissue paper. Carefully remove the tissue paper from your screen and grab you stocking. Center the tissue paper and pin it in place, near the top of the stocking. Then, take your embroidery thread and needle. 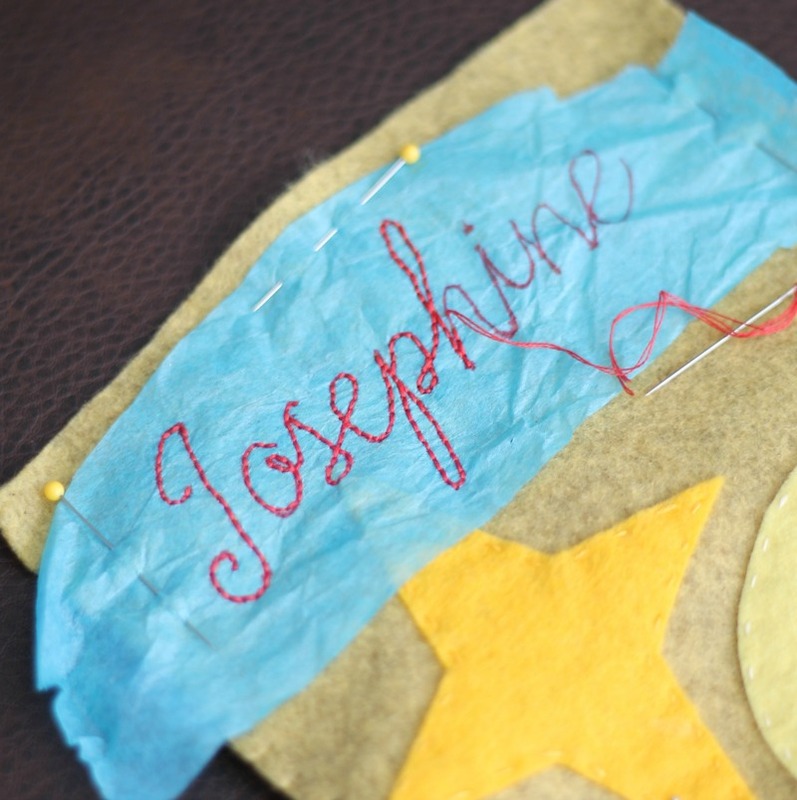 Using 2 threads in a contrasting color, stitch a back stitch along each letter of the name. As you can see in the photo below, you will be stitching through the stocking, as well as through the tissue paper. The back stitch is one of the simplest stitches. It is just a straight line, one stitch after another. My only advice with this step is to take your time and do small careful stitches. It might take longer, but you are creating a family heirloom here, right? Something that your child will look forward to pulling out and hanging up year after year. It’s worth it to do it right. After the stitching is done, it’s time to remove the tissue paper. Very carefully rip the tissue paper and pull it off in pieces, making sure to get all the little bits. And, once you add the back to your stocking, you are all done! See, that was pretty simple, right? Even you (and I) can embroidery pretty names on stockings! 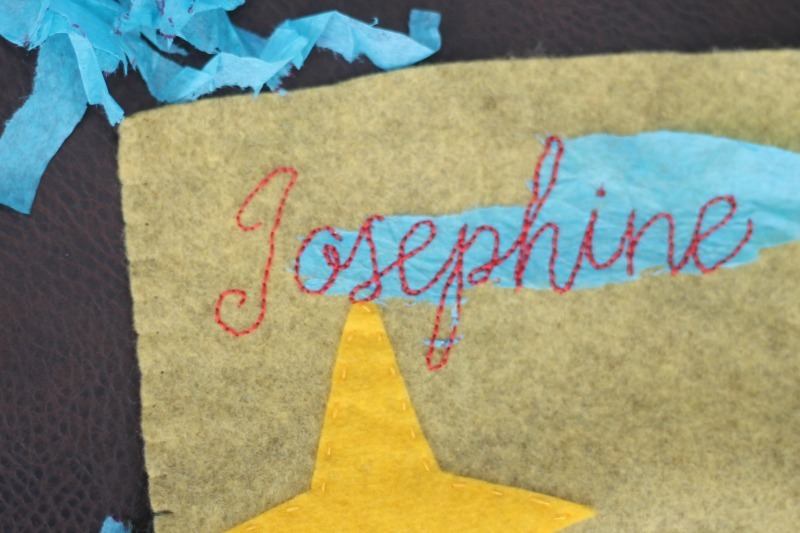 As you can see in the image, you can also add a name to a stocking with felt letters, cut out and stitched on. Those instructions and patterns come when you purchase one of the patterns pictured above. The stockings can be purchased together for $9 or separately for $3 each. The links below will take you to the esty listing, if you are interested. I hope that was helpful. And, if you purchase a pre-made stocking from Target and add a name with puff paint there is NO SHAME IN THAT. Please believe that. Christmas is not about stuff like stockings and trees and presents. It’s about Jesus. And that’s it. Blessings on you and your family this season! 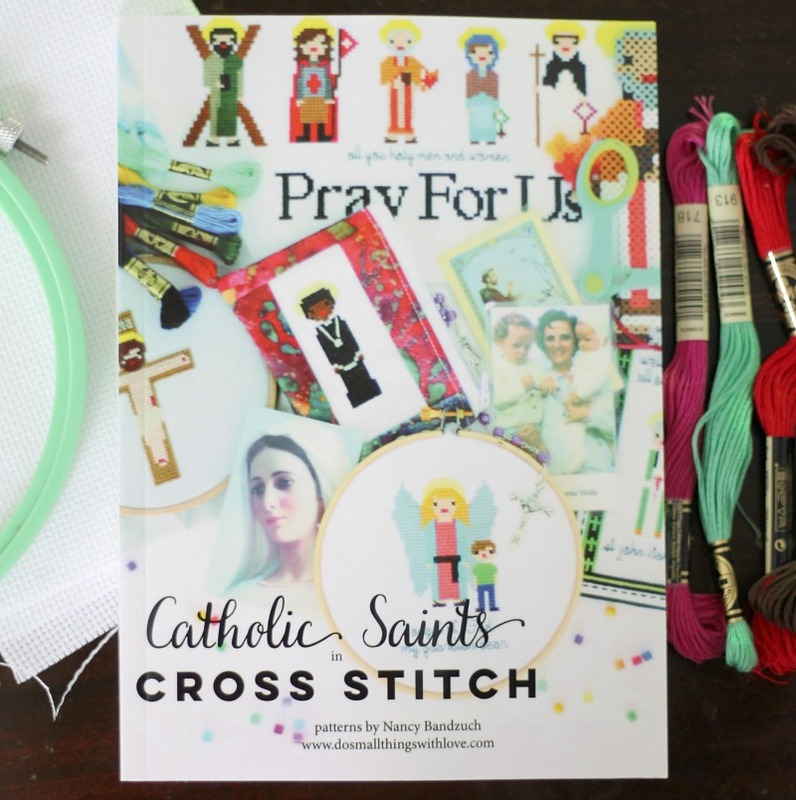 No longer just a digital download–the Catholic Saint Cross Stitch Patterns are now an actual book…which is on sale today! The printed book, in full color is available for $35. It includes ALL of my patterns! 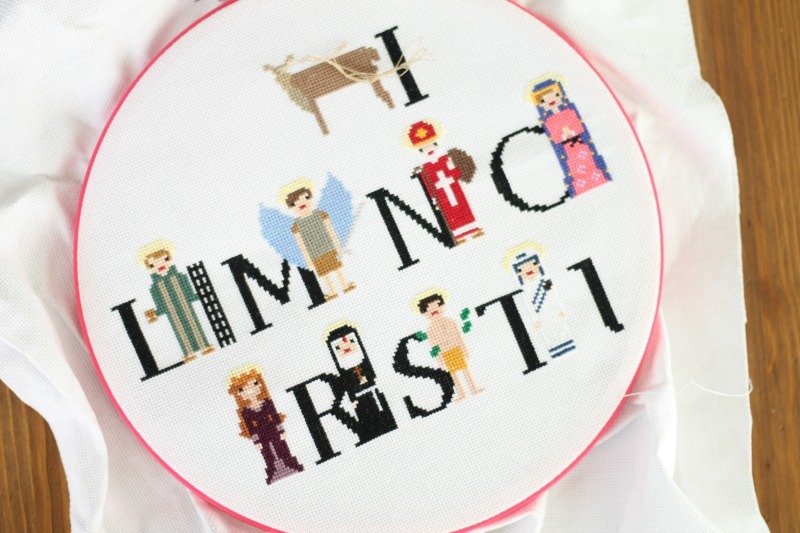 Yup–I even included the characters from the Old Testament and the Nativity. They are all in here. The book is printed in FULL COLOR. Although this made the book a bit more expensive, I think it was worth it because now children can grab the book off the self, pull out the perler beads and get creating. 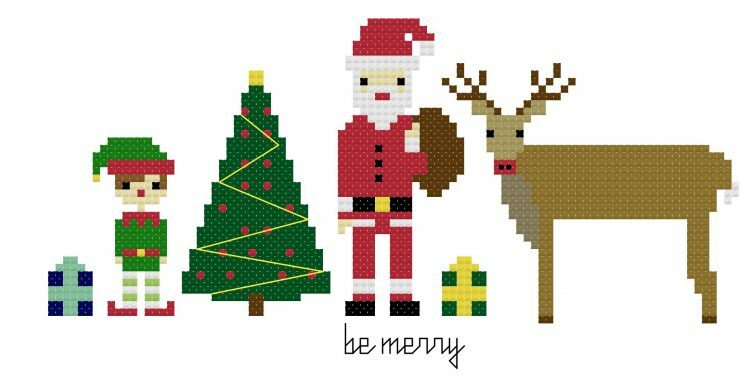 That’s right–the patterns can be used for both cross stitch AND perler beads. Also, the color makes it really fun to flip through. My kids enjoy just looking at the book and learning about the saints that way. 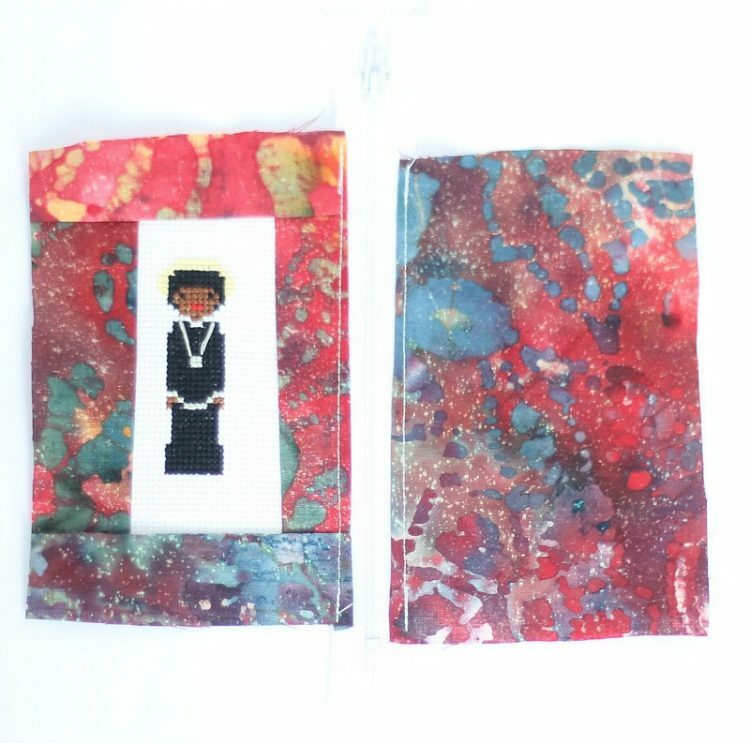 The book also includes 4 pages describing in detail how to cross stitch and a few never before shared patterns for Saint Quote Bible Bookmark patterns. 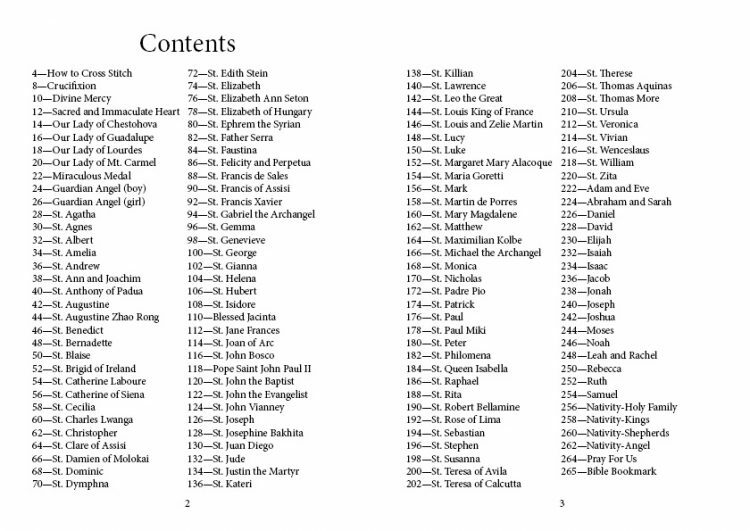 Each saint has a 2 page spread in the book. On the left is a color image of the pattern and on the left is the cross stitch pattern with legend. And, if you don’t know anything about Our Lady of Chestohova, stay tuned. She will be featured here real soon! I also created a ABC Sampler with the saints! Check it out!!! 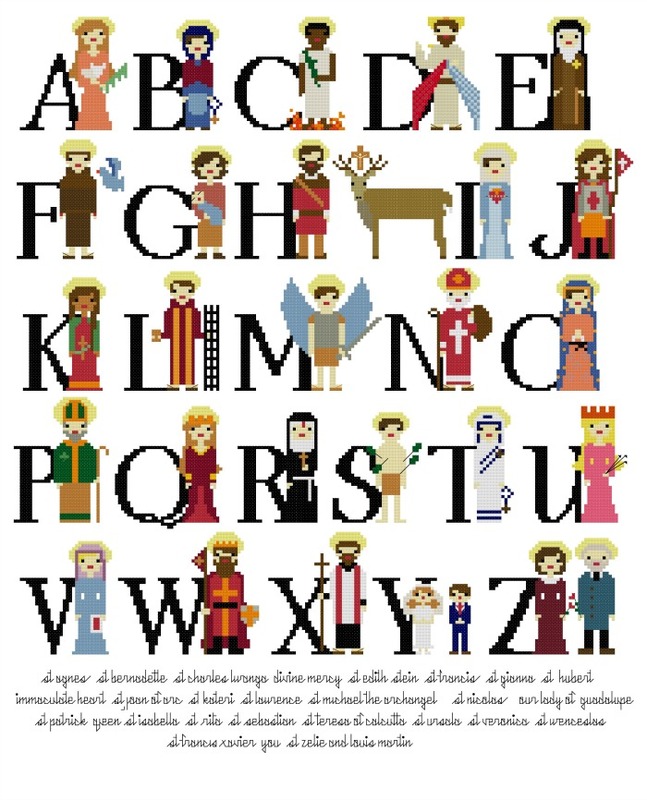 The ABC Saint Sampler is a Digital Pattern. The whole thing is $5. After you purchase you will be able to download the pattern right away. Yes, I have A LOT left to do, but I can’t even explain how excited I am to have this done and hanging in my children’t room. What better way to learn the alphabet? And that is basically it! Once again, here is the link if you are interested. 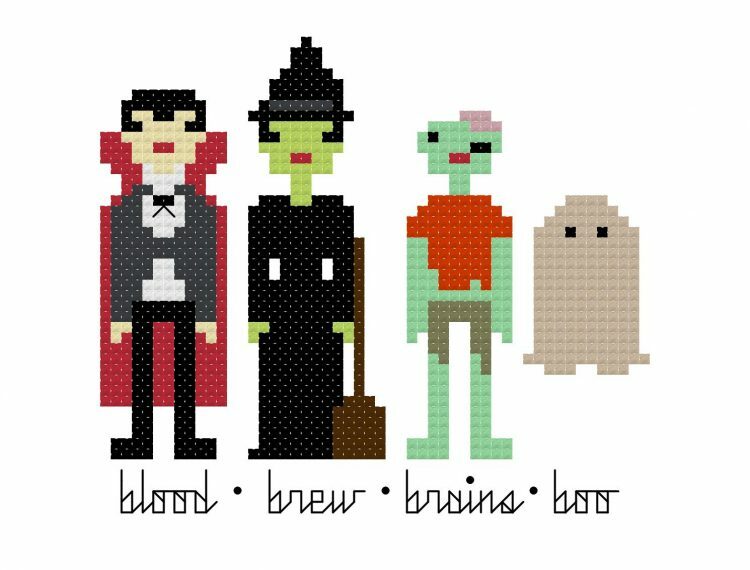 Everything is cuter in cross stitch. It’s a fact. And you know what we all need during these dark political times–more cute (and diligent prayers). I’m in a funny mood today. We are leaving on a BIG road trip tomorrow, so instead of packing/laundry/cleaning I am doing something totally silly–making cross stitch patterns. And you know what, I’m having a ton of fun (so get off my back!). Before now most of my patterns have been of the Catholic persuasion, and I LOVE those patterns (in fact, I am currently stitching up a BIG project using my Catholic Saint Patterns that I can’t wait to share with you) but today I stepped away from all things strictly Catholic in favor of (dun dun dun) the secular. So, I’m being a little dramatic, but, this is a bit of a departure for me. I decided awhile back that I was going to stop being a lame “lifestyle blogger”–meaning a blogger that posted about whatever tickled my fancy–and instead be a Catholic Mommy blogger. And I love what has happened around here once I dedicated myself to serving this specific and wonderful audience. But I still kinda love Halloween–all of Halloween. Even the witches and vampires and zombies, I love it. The block we live on has gone Halloween NUTS! One house a few blocks away has transformed their yard into a graveyard and it actually looks like zombies are crawling out of the earth. We drove by one night and it was all lit up, and I got major goosebumps–IT WAS AWESOME! Yes it’s all silly compared to the grand feast of All Saint’s Day the following day, but I just can’t help loving Halloween. 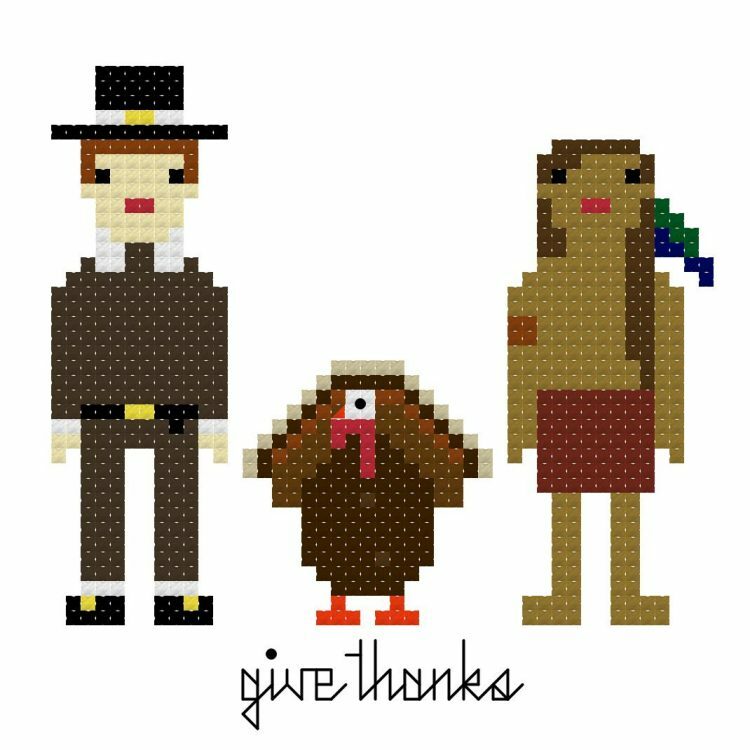 And loving all the folksy Thanksgiving stuff. And even Santa. These are things I grew up with. 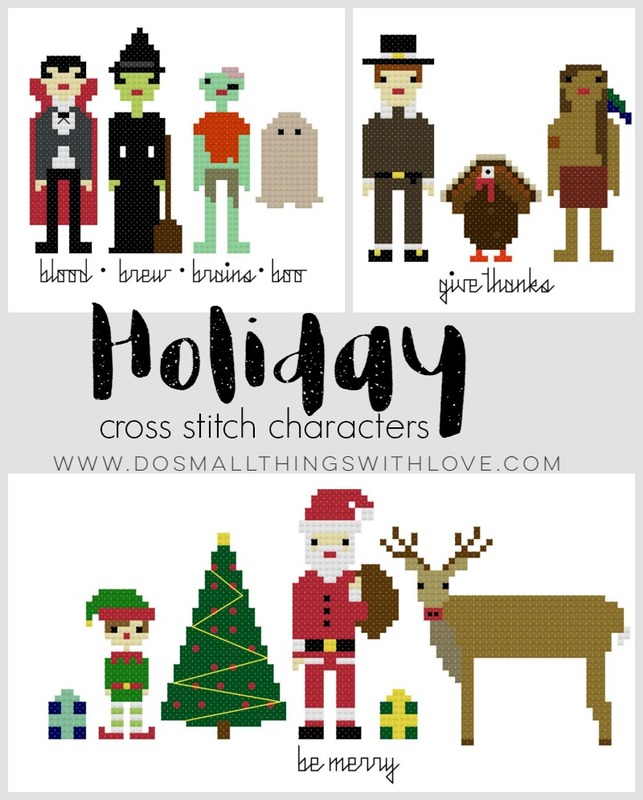 They are characters from stories I love and transforming them into cross stitch characters this afternoon made me happy. I can’t wait to finish stitching up these projects and adding them to my holiday decor. And now that I’m done with the patterns…and this post…I guess this means that I need to get to work getting this family ready for a cross country road trip. Sigh. As a young blogger I used to seek to appeal to everyone. 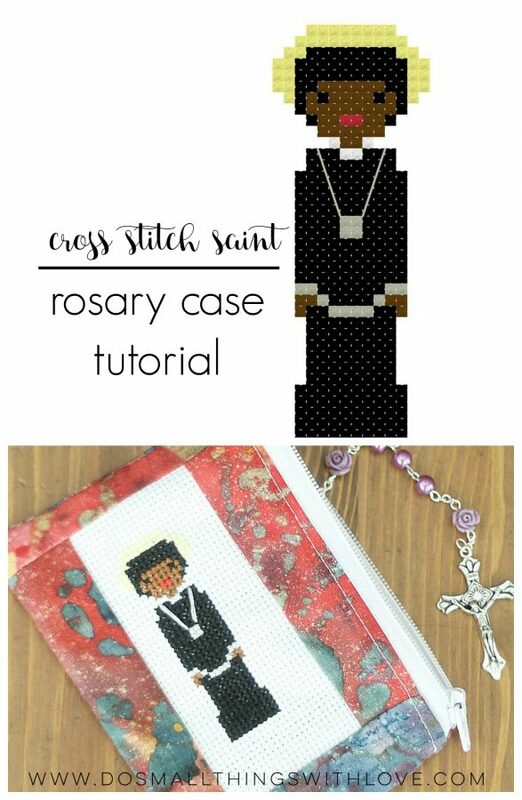 But, as you can see by today’s post title–Cross Stitch Saint Rosary Case Tutorial–things have changed! 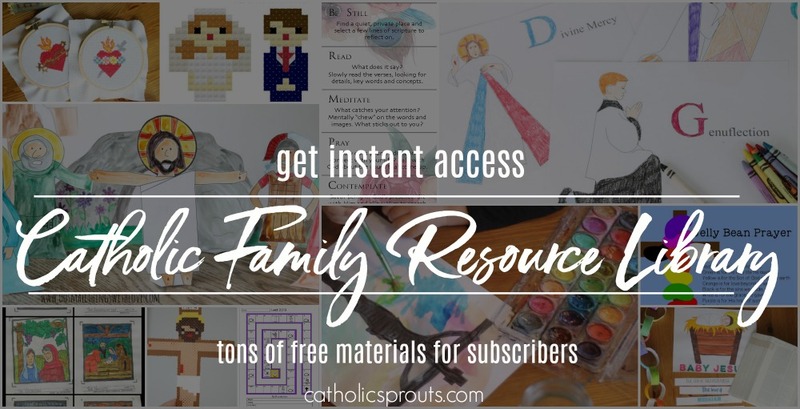 I love every single person that stumbles onto this site, but I have decided to write about what I know–the Catholic Faith, Family and Craftiness. 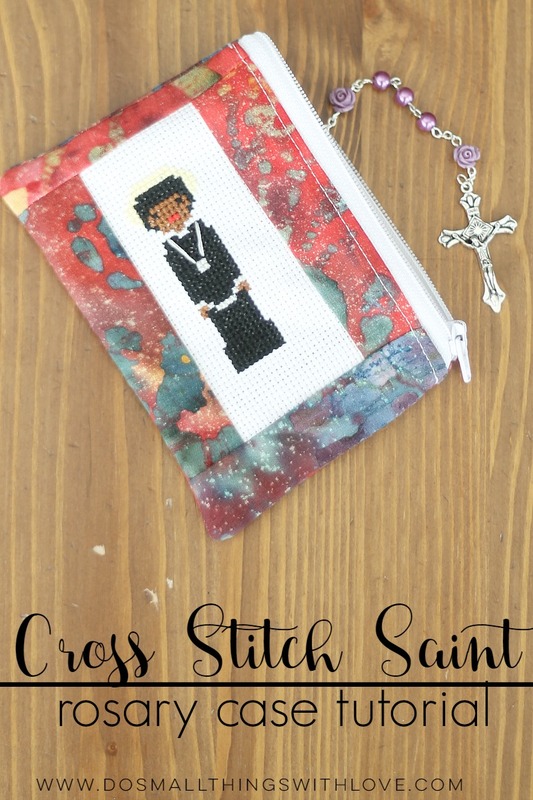 I created and sent the Catholic Cross Stitch Saint Patterns out into the world just under a year ago, and I continue to be blown away by the people that have purchased the patterns, sewn them up and fond such creative uses for them. I often get asked questions about ways to use the patterns, and I have been asked many times for ideas incorporating these patterns into Rosary Cases. So, Bernadette and I sat down at the sewing machine a few days ago and figured it out. It turned out pretty good, I think. 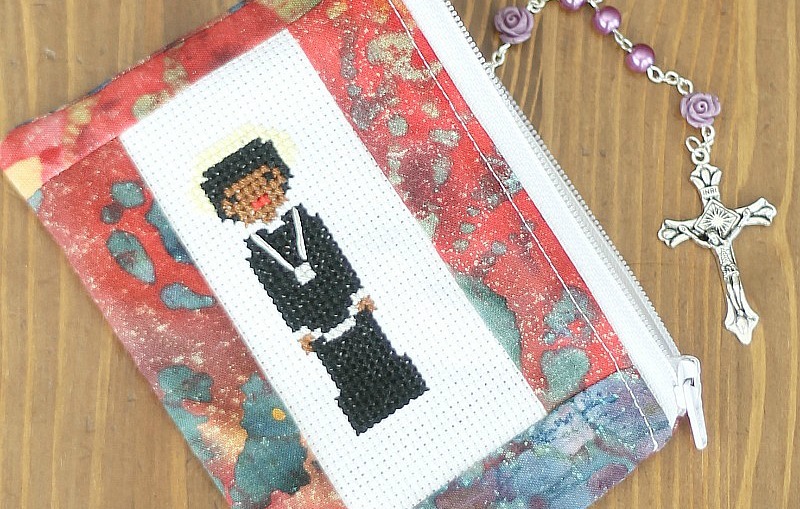 This is by no means the only way to create a rosary pouch with these cross stitch saints. It is only one way. What is more, I do not claim to be an expert seamstress. Far from it. Please, if you have suggestions on how this pattern/process can be improved, leave me a comment or shoot me an email so I can share it with everyone. 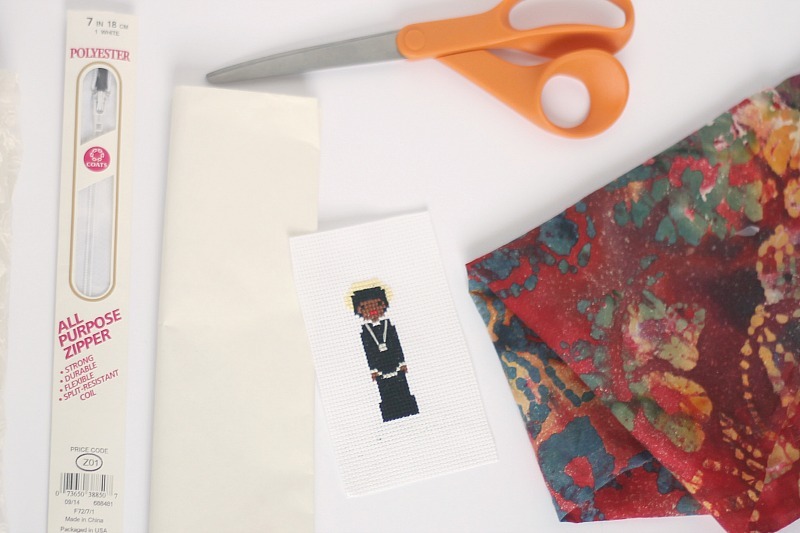 And another quick note, this tutorial is based on a saint stitched on 14 count aida cloth. 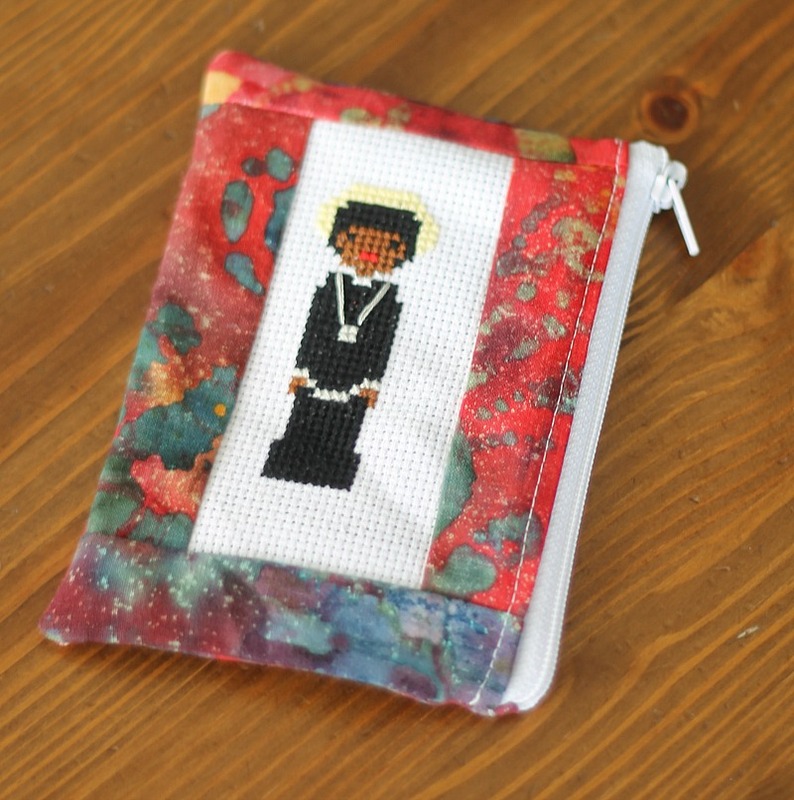 For saints stitched on 11 count cloth, your pouch will be bigger. For a saint stitched on 18 count, your pouch will be smaller. 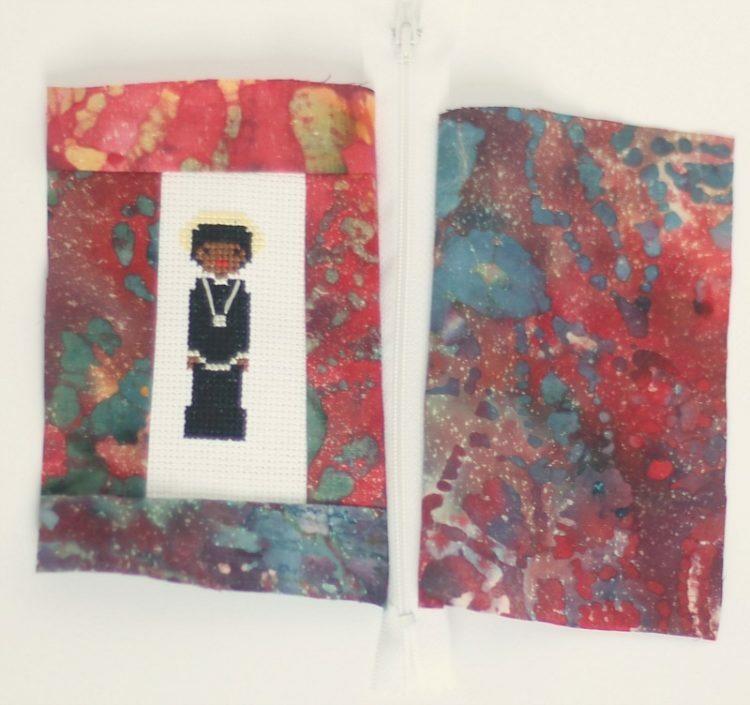 As a first step, trim your cross stitch saint, leaving 2 inches of aida cloth on all sides of the saint. Then, iron on the interfacing to the back of the saint. This will protect your stitches from the back. Next, lay what you have created (which will be the front of your case) on top of more fabric. Cut around it so you have 2 identical squares. Lay the pieces flat and sew down each side of the zipper. Once again, you may have to move the pull on the zipper as you work. Now, chances are the zipper you are using is longer than the pouch is, so you will need to trim the zipper. Move the pull inside of the pouch area, and trim the edges of the zipper. Then, with right sides in, sew around the outer 3 edges of the pouch. Turn right side out, push out the corners and Ta-Da! This is a very simple project and, in my opinion, a nearly perfect 1st sewing project for a young person. You don’t need anything more than a standard sewing machine and iron. And, don’t you think that this would make an incredibly special Baptism/1st Holy Communion/Confirmation gift? If you are related to me, don’t be surprised when you open one of these for Christmas! There you have it. If you have any other questions about the Catholic Saint Patterns or projects you can do with them, please send them my way. I might be able to answer your questions–and if I don’t have the answers I will do my best to figure them out.